Crime data suggests that the biggest crime hotspots countrywide are located in city centres. The latest data from the South African Police Service (SAPS) has shed some light into which areas are worst affected by crime in each of the country’s nine provinces for the 2018 year thus far. Crimes in South Africa should be reported to the police station that is nearest to where the crime occurred. This helps to give a good indication of the crime situation in any given area. However, some stations, especially in remote areas, have an overlap with other areas based on which station is better equipped to file the report. Since crime statistics can be directly linked to population levels, it is no surprise that you will find the highest levels of crime in the Gauteng, Western Cape and KwaZulu Natal provinces. This can be credited to the fact that they are home to three of the most highly-populated metro areas in the country. The worst province overall is Gauteng even though the worst precincts are found in the Western Cape. The total number of cases reported in Gauteng was 188,653. The total number of cases reported in the Western Cape was 202,872. The total number of cases reported in KwaZulu Natal was 156,585. The total number of cases reported in the Eastern Cape was 93,826. The total number of cases reported in Limpopo was 82,193. The total number of cases reported in Mpumalanga was 92,173. The total number of cases reported in the North West was 93,867. The total number of cases reported in the Free State was 82,614. The total number of cases reported in the Northern Cape was 43,861. 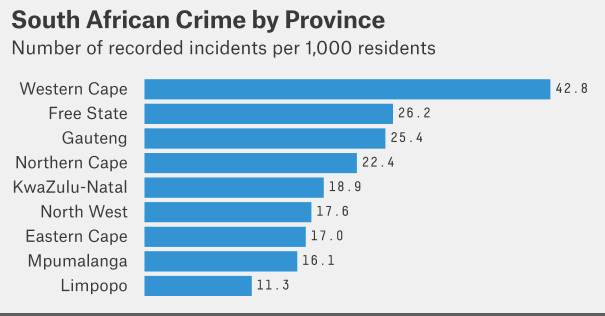 While crime rate, in general, is still quite high, all but one of the provinces have experienced a decrease in contact crimes, with the exception of North West which experiences a 3.2% increase in the 2017/18 financial year.